Another week, another walk and this time there was no getting around the bad weather. We have had lots of rain in recent weeks and the forecast was for more, the MET Office said that the rain was due to be around all day in the Peak District so I decided to stay low. I plotted a quick route, got all my waterproof gear and headed for Monsal Dale. It rained all the way there but thankfully I was greeted by a great sunrise and a clearing sky when I arrived. The route today was going to be a day of dales, Monsal, Cressbrook, Litton, Tideswell & Miller’s Dale to be precise. I figured that if the weather did turn bad there were lots of opportunities to stay out of the worst of it. I made my way across to the great lookout point near the Monsal Head Hotel and surveyed all that lay in front of me. The view from here is a Peak District classic, The Wye Valley snakes around from the west and turns south before your eyes. This place can become very busy in the summer months, its not very hard to see why (or should I say Wye). I headed down from the lookout point down in to the valley floor, the recent rain has really upped the river levels in the area and the Wye was running fast and high. It had burst it’s banks in places and the fields in the valley bottom were rather waterlogged. I couldn’t resist going for a look while standing on the bridge at SK 1817 7178, I didn’t cross over the bridge at this point, I decided to carry on along the road towards Cressbrook Mill. Cressbrook Mill is a great looking building, The original mill was built by Sir Richard Arkwright in 1779 but this burnt down in 1785 and was rebuilt by his son Richard Arkwright Jnr in 1787. There is an information board up on the Monsal Trail which this route visits later on. After I passed Cressbrook Mill I kept to the right of the road until I got to SK 1715 7334, I then took the path down to Ravensdale Cottages. There is a rather great looking Limestone cliff on the eastern side of Cressbrook Dale which is called Ravens Crag, The houses here looked very picturesque so I decided to take a few quick snaps. The next point you come to on the route is the entrance to the Cressbrook Dale National Nature Reserve. I recorded some stereo audio while crossing over the bridge in to the Reserve which you can here on the latest version of the Peak Routes Podcast. The river here was crystal clear and there was a great abundance of wild life. Squirrels, birds, rabbits and no doubt much more lurking in the undergrowth. The colours in the forest were so vivid, the contrast of the green against the brown of the forest looked spectacular. The image below hasn’t been played with in any way, if anything it was much more colourful in the flesh and I would highly recommend a visit at this time of year. I look forward to returning again in the summer months, giving myself some time to pause and soaking up the surroundings while having a brew by the river. After the forest section had finished I found myself back out in to the open dale once again, I climbed up and over some limestone rocks, went through the gate and I was greeted by the sun piercing through the clouds. The river had burst it’s banks slightly in the upper part of Cressbrook Dale too, I had to take the higher route on the northern slopes of the valley to keep out of the water. I passed the bridge which crosses the river at the bottom of Tansley Dale, I shall add that to my list of routes to take in the future when I revisit. After the bridge the valley weaves around once more, straightens up for a while and then takes another 90 Degree turn and it was at this point I went off piste. I headed straight up the hill from SK 1728 7531 to arrive at the base of the next landmark on today’s route, Peter’s Stone aka Gibbet Rock. Peter’s Stone or Gibbet Rock as it is no locally is a very famous landmark in this part of the Peak District. As the local name might suggest it holds a rather sinister history. It was at this great looking place that the final public Gibbeting in Derbyshire took place. Legend has it that the last person to be Gibbeted here was Anthony Lingard, a 21 year old Tideswell man. He was convicted of killing Hannah Oliver, the toll-keeper at Wardlow Mires in 1815. After his execution at Derby Gaol his body was hung in chains on Gibbet Rock for 11 years until it was eventually removed after complaints from locals about the gruesome chattering of his bones in the wind. If you would like to read more about this tale then you can find a great article over on the Derbyshire Heritage Website. I was unable to find out precisely where the gibbet was located on the Rock itself, maybe it was right at the top as Gibbeting was done to pose as a warning to others so it would have been highly visible up top. Maybe in summer I’ll come back here with friends and Bivvy on the top of the rock, that would be interesting :-). After a short break on top of Peter’s Stone aka Gibbet Rock I made my way down to continue walking up Cressbrook Dale, only for a very short while though. There is a path which crosses the river and doubles back on itself up the hill towards Litton, today however I had to make my own path over the river as the valley was flooded. I jumped over a few patches of water, balanced along the edge of a dry stone wall and made my leap for dry land on the other side of the river. I climbed out of the valley as the rain began to fall once again, I waved goodbye to Cressbrook Dale and then made my way along the road to Litton. I had accidentally left my wallet in the car or I would have treated myself to a refreshment from the village store. After Litton I walked along the road down Litton Dale in to Tideswell Dale, I took the path through the Access Land on the eastern side of the road which was a little more interesting than staying on the road. I was pleased to get away from the road and back down by a river once more as I headed down Tideswell Dale. This was the first time I had visited here and I can imagine it is lovely in summer sat on the banks of the river. The path crosses the river a few times as you head further down towards Miller’s Dale. After a short section along the road where Tideswell Dale meets Miller’s Dale you then arrive at Litton Mill. The Mill was built in 1782 by local farmers Ellis Needham and Thomas Frith. It became notorious due to its use of child labour and when reading its history it seems as though it was doomed from the beginning. There was a serious fire in 1811, the waterwheel broke and was out of action for a month. By 1815, Needham was bankrupt and had been given notice to quit. By 1828 he was a pauper. Frith fared somewhat better on his farm, and operating a small spinning mill near Tideswell. As is the case with Cressbrook Mill, Litton Mill has also been converted to residential apartments in recent years and still remains a stunning relic of the Industrial Revolution. I’m fascinated by this era in history, if you are too why not visit the section of Peak Routes that documents my visits along the UNESCO Derwent Valley Mills World Heritage Site. After you pass through the mill yard you pick up the concession path which runs along side the River Wye. This section of the route is very tranquil as you meander along slow flowing water towards Cressbrook Mill. If you visit on a day where the river levels are high then you may be required to take a diversion a little further down stream. The river level was very high today which meant I had to take the diversion that climbs up along the top of the Limestone cliffs near Cressbrook Hall. I had a quick walk down to where the path was flooded to get some pictures before heading back to take the alternate route. After I had taken the diversion due to the flooded footpath, I then had to take the concessional footpath which leads through the grounds of Cressbrook Mill in order to get back on track. I arrived at the bridge to find a raging torrent flowing over the weir below and creating what looked to be an excellent set of white water down stream. I recorded some more audio here with my Zoom H1 for the Podcast Episode and you can here the excellent stereo sound of the river as I cross the bridge. The path then heads out of the valley bottom as you make your way to the Monsal Trail, you get great views of the Mill as you climb up to the information board that I mentioned earlier in the post. 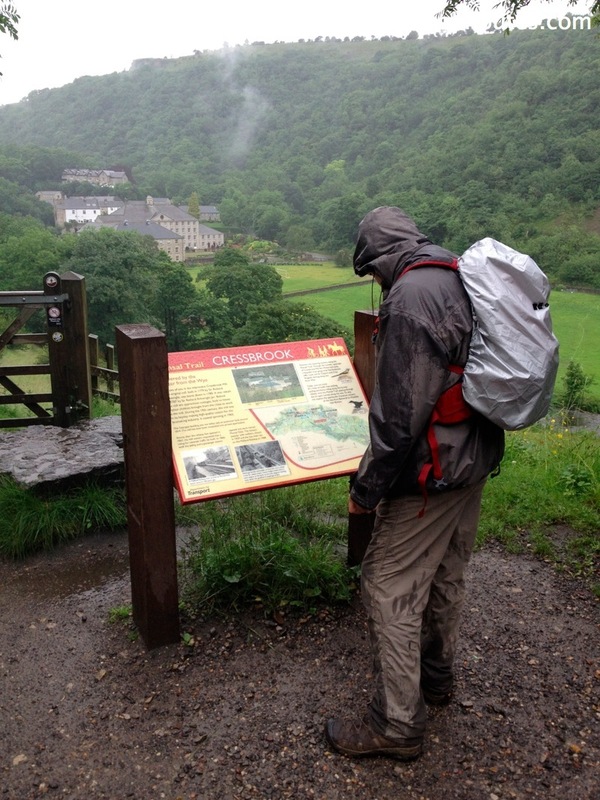 The image below is from a previous visit when my friend Andy and I walked along the Monsal Trail in torrential rain. Once again the heavens opened so my camera was placed firmly inside my bag so it didn’t get wet, I have a history of getting my electronics wet along the Monsal Trail so I decided not to take any chances today. Thankfully the rain eased as I made my way out on to the top of the Headstone Viaduct. The image below shows the view down Monsal Dale and you can see the hill top where the Iron Age settlement of Fin Cop once stood. Fin Cop is another one of the many sites of historical interest in the Peak District, if you would like to find out more then you can head to the following website – http://www.archaeologicalresearchservices.com/projects/fin-cop-hillfort. I had really enjoyed the route today, I had been meaning to do it for some time as I had been captivated when reading about the fascinating stories of the places you pass along the way. Peter’s Stone aka Gibbet Rock is a place I hadn’t visited for more than 12 years, the last time I went was while Geocaching when my father was over from Australia. Cressbrook and Litton Mill hold some great tales and I would highly recommend doing a Google Search to find out more. All in all the route was around 10 miles according to the ViewRanger app on my iPhone which I used to track my route today. You can also listen to the Podcast from today which is Episode number 10 and the first to be recorded with my new Zoom H1. Head on over to Peak Routes Podcast – Episode 10 – Monsal, Cressbrook, Tideswell & Miller’s Dale where you can find out how to listen, download and subscribe. Jees are you my brother from another mother or something? seems we go to the same places and take very similar shots. Great detail in your posts mate. My version doesn’t come close really. I love your site Phil, we are both gents who appreciate the fine landscape of the Peak District. Maybe we’ll bump in to each other at some point out there, all the best and thanks for commenting on my video too in last day or so. Cheers Dean, I hope we will man. Maybe some form of Collaboration, who knows? The mists of time hold the answer…. Thanks for the trip report again Dean,another on my to do list! 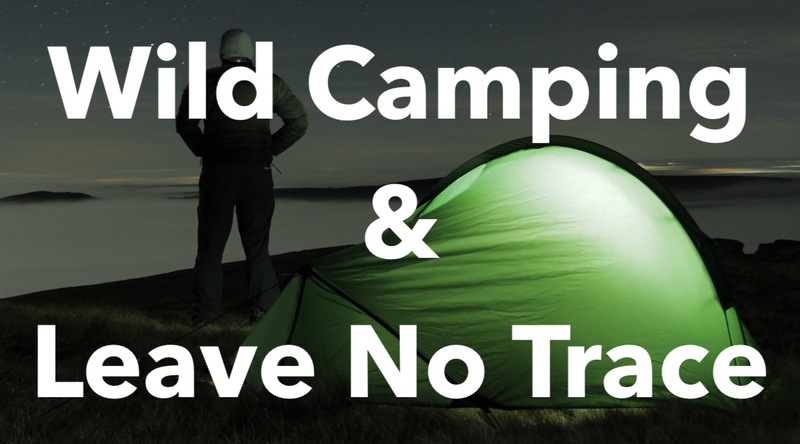 Off to Wales this weekend for a couple of days,might even squeeze in a nights camping! !